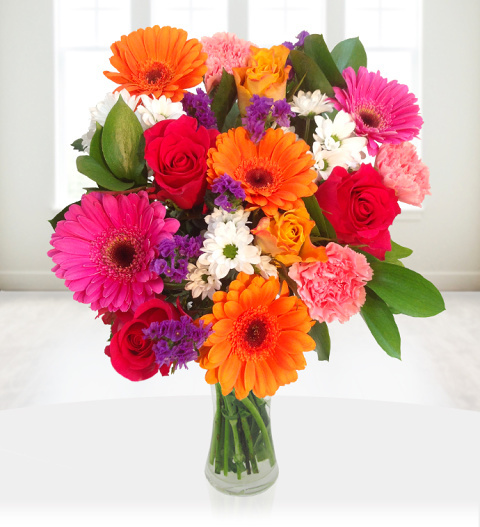 Our Sunshine arrangement is quite simply a delightful bouquet that is perfect for all occasions. Sunshine comes a FREE box of scrumptious Belgian chocolates. The bouquet is skilfully hand tied by expert florists with Germini flowers, memory and mango roses complimented with statice, carnations, daisies with forest fresh greens. This bouquet has a sweet spring fragrance that will be adored by all, a lovely feature for any setting. This is a stunning bouquet and is available for next day delivery. Chocolates may contain nuts.